Through direct-contact, we stage a ‘time travel’ to Colonial India, where the chapati (a form of unleavened bread) becomes the site for agency, insurrection and community, and then move back forward in time through a history of roti, (and bread in general), which is fraught with radically charged associations: of nobility (let them eat cake), Communist equality (those who grow it, will eat it), institutionalised poverty, where workers, day-wage earners, labourers and farmers carry rotis, salt, and an onion for a ‘working lunch’, and of institutionalised capitalism, where it is preferable for food grain to be burnt than donated. With this radically round low-tech weapon, this imperfect tool, how can we strategically engage with and resist the socio-political of the neo-liberal, xenophobic, and far-right positions of today? In a time where food in Finland is forced to undergo the strenuous processes of contactless cooking (forcing cafeterias to use pre-cutting, prewashing with sanitizers, dehydration process, and other ‘healthy’ cooking methodologies), what capitalist insurrections do eating a food that is necessarily made by ‘direct contact’ and eating with unassisted fingers, mean? 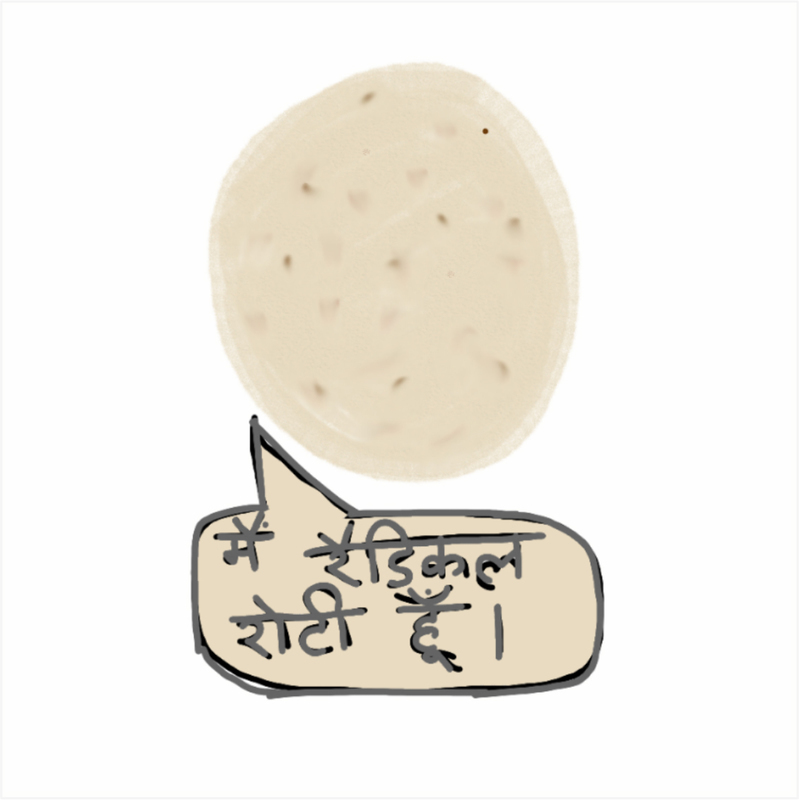 For Pixelache Festival’s 2019 edition, Breaking the Fifth Wall, we propose to cook chapatis (a type of Indian unleavened bread), made with wheat/rice/millet flour (made with different flour across three days), put together with an assortment of accompaniments that are typically served with it, such as salt, butter, jaggery, pickles, ghee, etc. The work will be in the form of a participatory performance installation, where we will knead the dough, cook the bread and bring to a table consisting of pre-arranged accompaniments. The audience will be expected to participate through the act of eating and conversing with each other, as well as with the cooks, who through the process of cooking will converse with eating participants and unfold the narratives of direct-contact. The performance will span through the whole duration of the festival, with three events. The performance is free of charge and there is no appointment needed. * The Chapatis served as part of the performance will contain wheat, rice, or millet flour. Beware of allergens! Are individual Helsinki based artists with a collaborative practice that deals with food and community, having worked in the past together on projects such as VICCA Food Journal and Outsider Caffe. Pixelache’s 2019 curatorial team have invited the pair to challenge festival goers through their culinary perceptions in collaboration with some of Pixelache’s food production associates and connections. Ali Akbar Mehta is a founder and current Artistic Director of the Museum of Impossible Forms, Helsinki. Through his research-based transmedia practice, he creates immersive cyber archives that explore collective memetic history, narratives of memory, identity, violence, and conflict. He has exhibited his projects in galleries and alternative spaces in New Delhi, Mumbai, Pune, Helsinki, and Tampere. He holds a BFA in Drawing and Painting from Sir J.J. School of Art, Mumbai, and an MA in Visual Culture, Curating, and Contemporary Art from Aalto University, Helsinki, Finland, where he completed a thesis text titled “Cyber Archive: Being and Doing Knowledge”. Some of his ongoing projects are “256 Million Colours of Violence”, “Contemporary Ruins of Kruunuvuori”, “War Room Echo”, “Regarding the pain of Other Cyborgs”,”New Frontiers: Critical enquiries for archives as Artistic Praxis”, and “Non-Alignment as Resistance: Towards Cyber Archives as counter-hegemonic practice”. He lives and works in Helsinki and Mumbai. In Vidha Saumya’s art-making, the format of the book has played a central role. The powerful drawings in Purdah (2007), which she made while studying for a Diploma in Visual Communications Design at the Srishti School of Art, Design and Technology, Bangalore, began with a curiosity about the religious and social ramifications of Islam. While at Srishti, Saumya was awarded a scholarship by the South Asia Foundation for an Independent Study Programme at Lahore’s Beaconhouse National University, in 2007. In Lahore, she documented ephemeral encounters with Lahori rickshaw-wallahs in a book of illustrations titled Guftagoon: Gutargoon (2008), which prompted her to repeat the adventure with their counterparts in Bombay. The following year, she developed a book of drawings titled Explosives (2009), which enacted an overheated sexual fantasy; but its shock value was blunted through a repeated assault on our senses.